If you follow my blog, you might have caught my post yesterday about how I bought an Amazon Echo device, and have begun creating my own custom actions for it. I started small, simply making it call out to my web server by using If This Then That (IFTTT – a website that allows you to connect and integrate different services). I got it to connect to my door lock and unlock service I had written, and even got it to chromecast specific pre-setup videos to one of my TV’s using a command line tool. Feeling somewhat confident I decided it was time to take on something a little more in depth, but oh so worth it. I was going going to make Alexa order me a pizza. If you are an Echo/Alexa user you might know that there is already support for ordering a pizza but only from Dominos. It uses some system of having a saved order, then tweeting a specific bit of info at the Dominos twitter account that is tied to your order which then places it. This has a few drawbacks. Primarily being that it orders you a Dominos pizza (sorry guys, in all fairness Dominos has gotten a lot better in recent years). Also it requires twitter integration, and as far as I know only supports one order that you have saved (I could be wrong). The using a saved order was a good idea as it streamlines and simplifies the ordering process quite nicely. I wanted to do something like this, but instead I wanted Sarpinos pizza, and I wanted to be able to pick from several different pre-created orders. Using my knowledge of browser automation that I picked up from my door lock/unlock project and my existing web server, I got to work. First off, I had to figure out all the things that needed to happen. Off the bat I knew I’d be using their online ordering interface. They don’t have an API, so I knew I’d have to be automating browser interactions. Next I had to break down the process of ordering the pizza online step by step, all the HTML elements involved and how to interact with them. Then I would be able to automate those interactions using the Selenium library. So I went through the process like a normal person and created this list. At each step I inspected the HTML elements involved and recorded them so I could figure out how to identify them and interact with them later. I created an order and saved it as a favorite so next time I’d come back in I would be prompted if I’d like to order that again. From there I was able to create the following list of things I knew needed to get done. A fair amount of steps, but none of them super complicated. I knew I’d have to learn a bit more about Selenium as this interaction was definitely more complicated than the door lock code, and that one was already seemingly over complicated. Thankfully I did, and found out that in my previous attempt I had been mixing synchronous and async methods unknowingly hence leading to perceived complexity (I thought driver.wait() was a async method and you put everything that depended on it inside. Turns out it’s synchronous and once the condition inside is true the program continues. No wonder it was acting a little funny). I knew also since I was going to be passing in a fair amount of data (username, password, order id, credit card info, etc) that I should probably define an object which would have all the required properties, then just pass JSON into my web service that mirrored that object. This is what I came up with. Obviously the sensitive values are blacked out, but you get the jist. My webserver is already primed to look for post requests that have a JSON payload. The ‘router’ code looks at the ‘action’ attribute to figure out what function to send the payload to. I created a new ‘pizza’ action and related function. Here is that function. //wait until the pay by credit card button shows up. //stupid jQuery ui selects are impossible to set with normal selenium since the original select is hidden. So use an execute script to set em. //wait for confirmation page to load. Now if that code seems a little dense or confusing, don’t feel bad. It took me several hours of trial and error to figure it out, especially then it came to setting the select list values, and getting the script to wait while various elements where created and destroyed by the page. Selenium has this super fun behavior where if you ever try and reference an element that doesn’t exist, the whole script goes down in flames. In response to that I made my code very ‘defensive’ checking to make sure elements that are required frequently before attempting to interact with them. With the script created and integrated into my web server ‘router’ I was ready to get IFTTT to invoke it. Once again it was as simple as creating a new recipe with Alexa as the If and the Maker make a web request feature as the do. You can see that with the combination of specific phrases and the fact that you can have multiple saved orders, it would be easy to setup many different possibilities. My roommate is even going to create his own IFTTT account and link it to my Alexa. Then he can create his own orders, specify his own credit card information in the JSON payload, and order whenever he wants using the same device but have his own information. The next step I think is to encrypt the JSON payloads which contain the credit card info and then decrypt them when the arrive at my server. That way I’m not storing my CC info in plain text anywhere which right now is a bit of a concern. This was mostly just proof of concept stuff last night, but I was too excited not to share this as soon as I could, so some of the ‘polish’ features are missing but overall I think it’s a damn good start. Now if you’ll excuse me, I’m going to get myself a pizza. Update: Adding encryption was pretty easy. First I got some encrypt and decrypt functions set up. Like this. Then update my incoming data object so that the encrypted data was in its own property so I could still tell what kind of request it was without having to decrypt the payload first (since my webserver supports other, unencrypted calls). 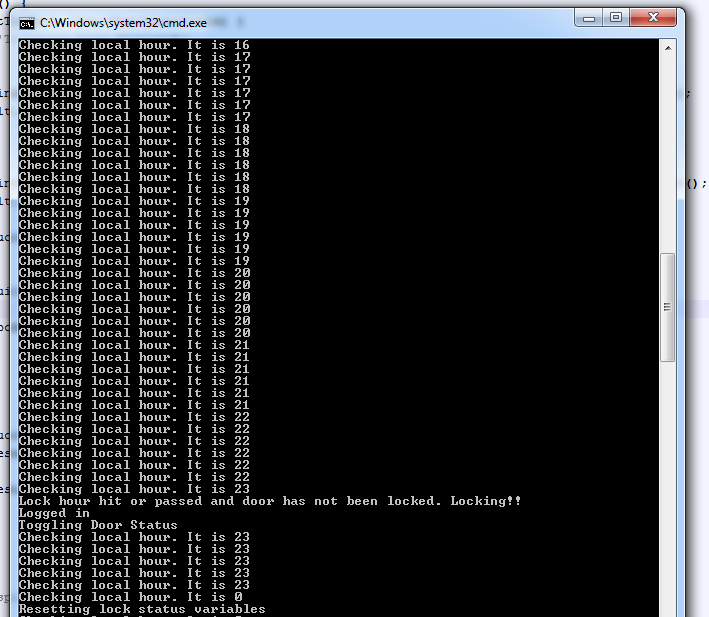 Then just had to change my ‘router’ to decrypt the incoming data if encryption was detected. After that I just had to use the encrypt function to generate an encrypted version of my pizza request data, update the IFTTT recipe with the new request and that’s it! Now my CC information is safely encrypted and I don’t really have to worry about it getting intercepted. Yay security. So if you saw my last blog, you know I spent some time writing a small application that would log into my home security providers website, then lock and unlock my door on a timed schedule. If you haven’t read it, check it out at https://iwritecrappycode.wordpress.com/2015/10/21/automating-things-that-should-already-be-automated-with-selenium-and-node-js to get some context. While that was great and all, I figured I could do more with it. I mean timed scheduled are great, but I do occasionally leave the house so you know what would be really cool? If my door automatically locked when I left, and unlocked itself again when I returned home. I figured it should be a reasonably simple process to make my script respond to remote commands, and trigger my phone to send such commands when leaving and entering an area. Turns out I was mostly right. At it’s core its pretty easy, but there are a lot of moving parts and places to make mistakes, which I did make plenty of (it’s crazy how often as a programmer I type the wrong numbers in somewhere). So obviously the first part of this challenge was going to be to setup my script to respond somehow to external requests. Being written in Node.js it made sense that it respond to web requests. I figured the requester should provide the username and password to login to the security website with, as well as a desired action of either lock or unlock. I decided to make it respond to POST requests just to reduce the possibility of some web spider hitting it and by some fluke making it do something (I also put the service on a different port, but we’ll cover that later). So the service listens for post requests with some JSON encoded data in the request body and then makes the request to alarm.com. The code for that method is as follows. So now with a server that listens, I need to allow requests from the outside world to come in and actually get to my server. This is where my old days of networking came in handy. First I decided I’d like to have a domain name to reach my server instead of just an IP address (maybe I can setup dynamic DNS later so if my home IP address changes, my registar it automatically updated with the new one and will change my zone file records). I know this is more of a programming blog, but just a basic bit of networking is required. 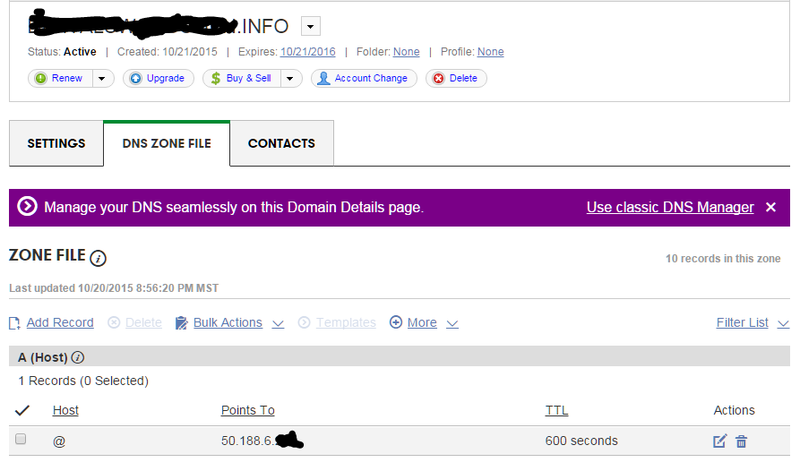 First I headed over to GoDaddy and grabbed myself a cheap domain name. Then changed the DNS settings to point the @ record at my home IP address. Now going to my domain would send traffic to my home, but of course it would be stopped at my firewall. 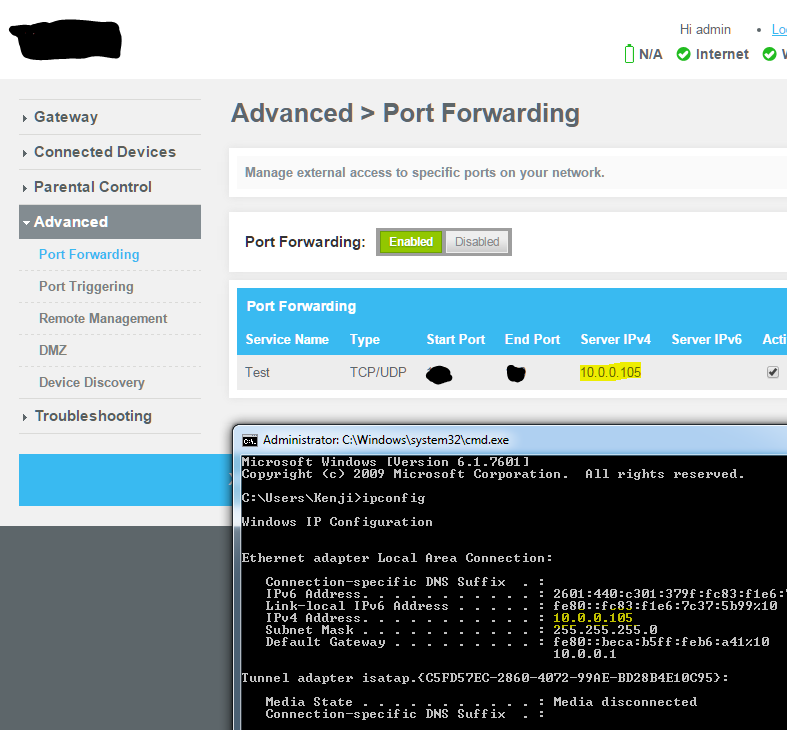 So I had to setup port forwarding in my router. This is where I was able to change from using the web traffic port 80 to my custom port to help obscure the fact that I am running a web server (as well as having to change the listening port in the Node script). Of course I decided to turn off DHCP on the machine hosting this and give it a static IP address. I would have used a reservation but my crappy router doesn’t have that option. Lame. After some fiddling with settings for a bit my service was now responding to outside traffic. The only bummer part is that my domain name does not work within my network because again my router is crappy and doesn’t support NAT loopback, so it doesn’t know how to route the request to the right machine internally. I could modify my hosts file or setup my own DNS server but it’s not worth it seeing as this service is only useful when I’m outside my own network anyway. Now the trickiest part, I needed to find a way to make my phone detect when I entered or left a given geographic region and when it detected that, send the specially crafted POST request to my server. I knew of two options off the top of my head that I had heard of but never played with. The first one I tried was a service called ‘If this then that’ or IFTTT for short. While the website and app are very sleek and they make configuration of these rules very easy, there was one problem. It just didn’t work. No matter what I tried, what recipes I configured nothing worked. Not even when triggered manually would it send the POST request. After playing with that for a bit, I decided to give up and give the other app I had heard of a shot. Tasker. So if IFTTT is the mac of task automation (sleek, easy, unable to do the most basic things). Then Tasker is Linux. It’s extremely powerful, flexible, a bit difficult to understand and not much to look at. It does however have all the features I needed to finish my project. I ended up buying both Tasker (its like 3 bucks) and a plugin for it called AutoLocation. You see Tasker by itself is fairly powerful but it allowes for additional plugins to perform other actions and gather other kinds of data. 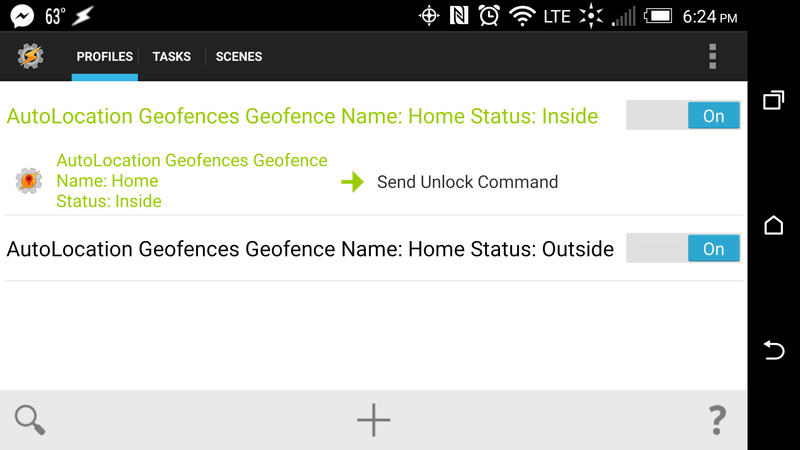 AutoLocation allowed me to easy configure a ‘geofence’ basically a geographic barrier upon passing through which you can trigger actions. 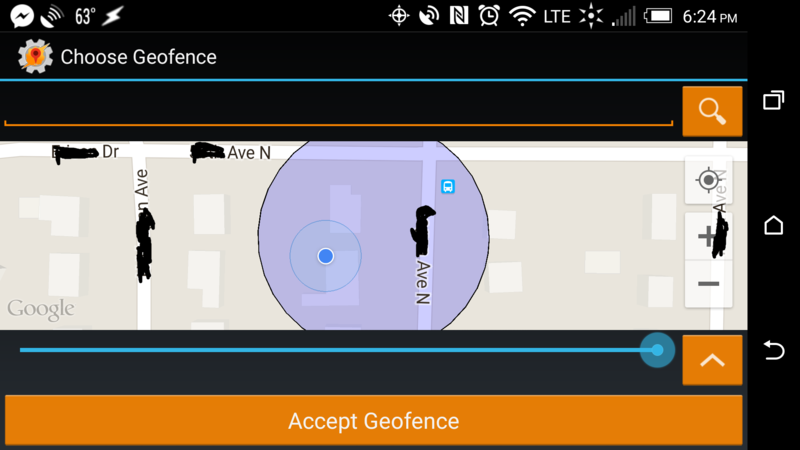 So I configured my geofence and then imported that config data into Tasker. Then it was simple a matter of created two profiles. One for entering the area and one for leaving it. I also added a simple vibrate rule so that my phone will buzz when either of the rules trigger so I know the command was sent. Later that night when I headed off to the store, that little buzz was the sweet vibration of success. I may or may not have yelled for joy in my car and frightened other motorists. I hope perhaps this post might inspire you to create own you crazy automation service. With the combination of selenium, node, tasker, and a bit of networking know how it’s possible to create all kinds of cool things. If you’d like to download the source code for my auto lock program you can grab it below (I don’t really feel like making a git project for something so small. Also I realize its not the best quality code in the world, it was meant to be a simple script not a portfolio demo). So I had invited my parents over a while back, and it came up that I don’t often lock my front door. Of course being good parents they chided me about it saying that I should really do so. I really have no excuse because I even have an app that allows me to to it remotely (yay home automation) but the be honest I’m just forgetful when it comes to things like that. However I decided to heed their warning and do something about it. I decided if I was going to get diligent about locking my door, I couldn’t be the one in charge of actually doing it, I’d have to make a computer do it. The problem is, that while my home security provider does offer a web app, and a phone app for locking the door and a very basic ‘rule’ system (arm the panel when the door is locked, vice versa) there are no time based controls, so I’d still have to actually do something. Totally unacceptable. After some investigation I found as I had figured that my security provider does not offer any sort of API. Nor would it be easy to try and replicate the post request that is send from the app to trigger the lock door command due to numerous session variables and cookies and things include unique to each login session. Nope, if I was going to automate this it seemed like I’d actually have to interact with the browser as much as the thought displeased me (I’m all for dirty hacks, but c’mon). At first I looked at python for a solution, but as seems to often be the case with python every discussion of a solution was disjointed with no clear path and generally unsatisfactory (sorry python). Instead I turned to Node to see what potential solutions awaited me there. After a bit of looking around I found Selenium for Node. While it’s obvious and stated focus was on automated web app testing, not intentional browser automation scripts I could see no reason it wouldn’t work. Finding the required name property is easy. Then simply tell Selenium to populate the boxes and click the login button. Thankfully just through dumb luck when creating this my session had timed out and I found out the login page accepted a return url parameter that it would direct the browser to after successful login. So now, if the login goes smoothly, the browser should be at the screen where I can control the locks. A different button is used to lock or unlock the door and only one is visible at a time. So writing my function in such a way that it accepted boolean ‘lock’ (where false would be unlock) param and then failing if it’s not able to find the button is a safe way to ensure I don’t unlock the door when I mean to lock it and vice versa. It’s just a function that is called via setInterval every hour. It checks the current hour against my two predefined lock and unlock times. I used a couple variables to track if the door has been locked or unlocked so if I reduce the time on the event loop it’s not attempting to lock/unlock the door every few minutes and wearing out the batteries on the motor. Obviously omitted from this is my alarm_username and alarm_password variables stored higher up in the script. With this event loop and the Selenium automation function I now have one less thing to worry about. Now if I could just find a Node.Js host that supported Selenium (damn you Heroku). So if anything, I’d say this is the take away: Don’t do manually what you can automate, and browser automation with Selenium is crazy easy. So easy that when it all worked I was almost disappointed that it seemed like I didn’t do anything. As some of you may be aware I have recently accepted a new position as senior developer at RedKite technologies. They are a consulting firm specializing at implementation and custom development of Salesforce, mostly for financial organizations (but not exclusively). While I am extremely excited for this new opportunity to work with an awesome team and continue to grow my skills, it does mean that I will no longer be able to do freelance work (it could be taken as a conflict of interests kind of thing, you understand). So as of now, I am sorry but I have to decline any offers for freelance work, at least until the smoke clears and some details are figured out. I just got a bit of recognition from work. I’m pretty happy about it. This week, we are going outside the Recruiting Department to give a special MVP award to Dan Llewellyn. Dan is responsible for so many of the programs and processes we rely on, and he has a lot of pressure on him from all departments to make sure these processes and programs run efficiently and properly. Since there is only one Dan, we sometimes have to wait for things we know are important, realizing that he cannot do everything at once. •	Inline editing – this allows callers to edit contact information without having to open another window. •	An account feature – callers can click on the account name right from their list and it pulls up the account detail information right in their list. They can scroll down to see all the contacts in the household. This will be very helpful when working kid’s studies. Callers will not have to open up another screen to see this data. Dan went well beyond what we were asking for, to provide value-added services for our calling team. We know his services and skills are in high demand throughout the company, and we appreciate him for taking the time to resolve some of our issues and add some nice features for us.